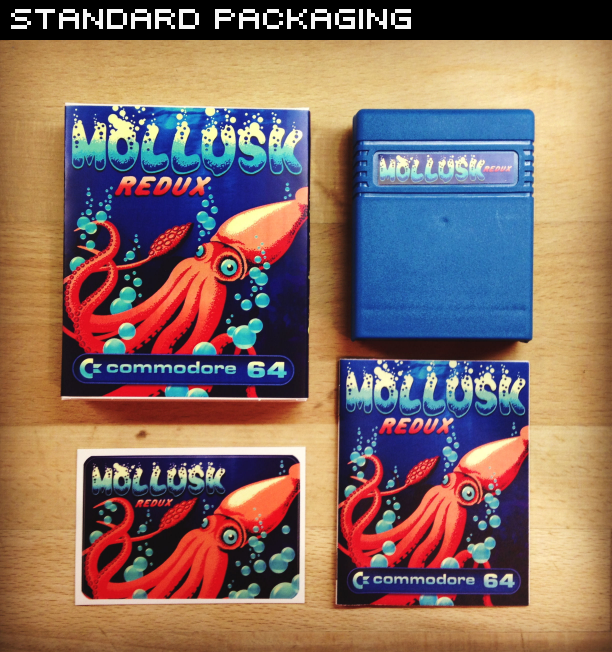 Download Mollusk Redux in .bin/.crt cartridge format HERE! 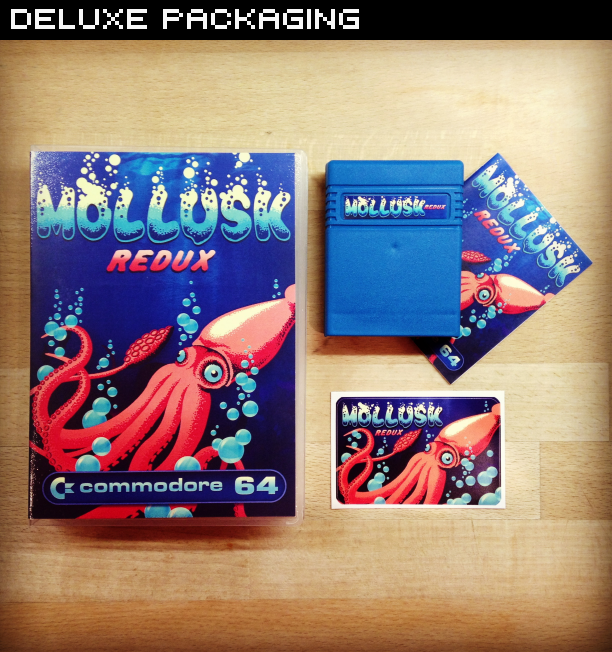 Download Mollusk Redux in .d64 disk format HERE! BONUS! Check out Onslaught's cracked version in .d64 disk format HERE! BONUS! Check out the original 2011 competition entry HERE! 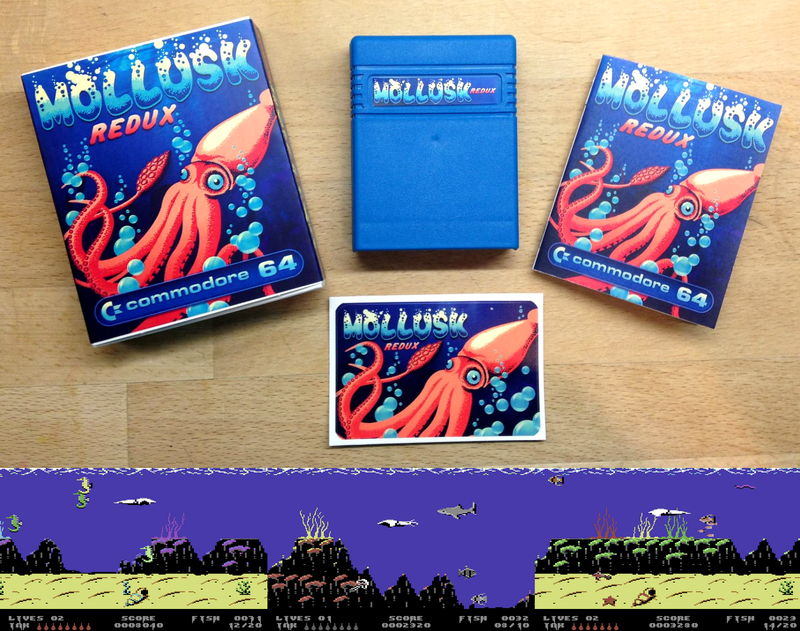 Dive into the ocean and guide the mollusk through 24 levels of excitement in this C64 exclusive underwater eat 'em up! * A limited amount of fishes to eat on each level. To play the game (downloaded from the links above) you will need either a real C64 (and a method of transferring the files over to it) or an emulator. For emulator users, we recommend VICE, as it works on a variety of systems and is very user friendly. Just download the emulator and drag and drop the .d64 file into the open program window (or attach the .crt image from the file menu). The game is set across four oceans (Atlantic, Pacific, Indian and Antarctic) each made up of six levels. The goal on each level is to eat a set quota of fish whilst avoiding enemy eels, piranhas, sharks and falling anchors. Your mollusk isn't defenceless though - you have a reserve of ink at your disposal! The fish stock of each ocean is rapidly depleting - much like in real life - so you'll have to move quick. The stock level reduces when fish leave the screen, so try not to let too many get past you as you zoom about the ocean! When the stock runs out, you'll lose a life. The simple HUD on the bottom of the screen functions using both characters and colours. Ink is represented by eight little droplets. These deplete with use and can be recharged by eating jellyfish. Standard ink (grey on the HUD) scares enemies or other fish away and is obtained by eating white jellyfish, whereas poisonous ink (red on the HUD) kills enemies. When you have a reserve of poisonous ink left, any additional ink obtained will also become poisonous. Note that kills achieved using poisonous ink are added towards your fish quota. Your Mollusk can take two hits from eels or anchors, after which point the lives counter on the HUD will flash red. Another hit will cost you a life, and note that blue eels also slow the Mollusk down. Sharks and piranhas are deadly to touch. The fish stock level flashes red and an audible alarm sounds when there are 20 or less fish left in the ocean. Fish eaten - 40 points awarded. Red flashing fish eaten - 200 points plus 40 more fish added to ocean. Blue flashing fish eaten - 400 points plus counts as 10 fish eaten. Stage complete - 2000 points awarded. All stages complete - 8000 points awarded. An extra Mollusk is awarded for every 10,000 points achieved at the end of the current stage. The disk version of the game saves and loads scores automatically. Below is a short gameplay video recorded using the VICE emulator showing the first few levels of the game. Mollusk & Mollusk Redux are copyright Achim Volkers 2011-2012. Published on 16KB C64 cartridge by RGCD, 2012. 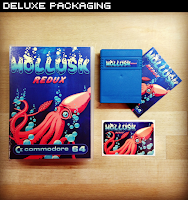 Mollusk Redux has been tested on both PAL and NTSC machines, and works on the C64, C128 and C64GS (there is no keyboard input required to play). Although it runs on NTSC hardware, it does play fractionally faster and will be harder as a direct result of this. As such, the game is labelled as NTSC compatible, but designed for PAL systems. 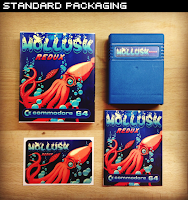 The cartridge version is available to buy from our shop on physical C64 cartridge. The game is presented in a blue cartridge shell, complete with a box designed by Flemming Dupont, a vinyl sticker and a printed manual. The cartridge version is available in two packaging types, a standard card carton and a more expensive 'deluxe version' that comes in a plastic case (a Universal Game Case with a specially cut foam insert to hold the cartridge). The standard version is priced at £17, whereas the deluxe version costs £22. Shipping is £4 for UK/Europe and £5 for the rest of the world. Strange move to promote a cracked version on a sales page. Strange? Not really... The game is provided for free download anyway and the cracked version offers trainers and so.